This is the title of my 191 picture photobook. This publication came out in August 1995, the 50th anniversary of the atomic bombing of the city. The book, written in English and Japanese, has been available in various book stores in Hiroshima, but most sales have been from the Hiroshima Peace Memorial Museum. The book has been very successful, and several print runs were made. However, the text for the book has become somewhat dated as it was written in 1995 and Hiroshima Museum have decided they wouldn't continue selling it once the current stock has sold. I have just, April 4th, 2007 received a fax from Japan stating that there are now only 3 Hiroshima Calling books left in the Peace Museum. I have no plans to update the book, or make a second edition. It took seven years of photography to make the first edition. I tried to chose images for the book that would be timeless, and anyone visiting the city today,and especially around August 6th and its commemorations would recognize the scenes. All of the images from the book are available on this website in the Hiroshima parts 1-4 features section. 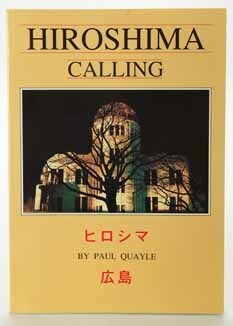 If you are interested in receiving a copy of my 'Hiroshima Calling' book, especially suitable for schools, libraries, peace groups etc please contact me as there are several hundred stored at my translators in Atlanta, USA, and a few copies remain in store rooms in England and Japan. I'd be looking at a donation of no less than US$10 to cover postage, packing and fulfillment. I'm not undervaluing my photography, and though the message of the book today remains as important as twelve years ago when it was first published, as a book with its dated text it has run its course. I have also published a set of twelve postcards taken in Hiroshima Peace Park that are primarily on sale through Hiroshima Peace Memorial Museum. Thousands of these cards have been sold, 18,000 postcards in one August month alone, so check out your fridge door, you may have seen one of my cards already! If you would like to get your hands on this popular set - to send some peace in the post - just contact me for an order. 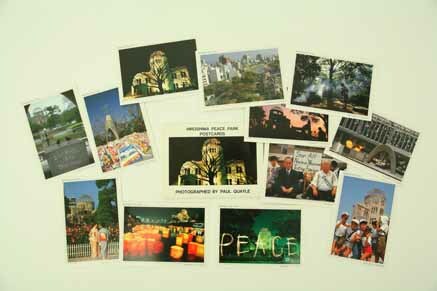 The set of 12 postcards are priced at US$5.